Meet WESTON - The stylish West Springs townhouse with DOUBLE attached garage. The OPEN floor plan with bay window allows lots of natural light to pour in. 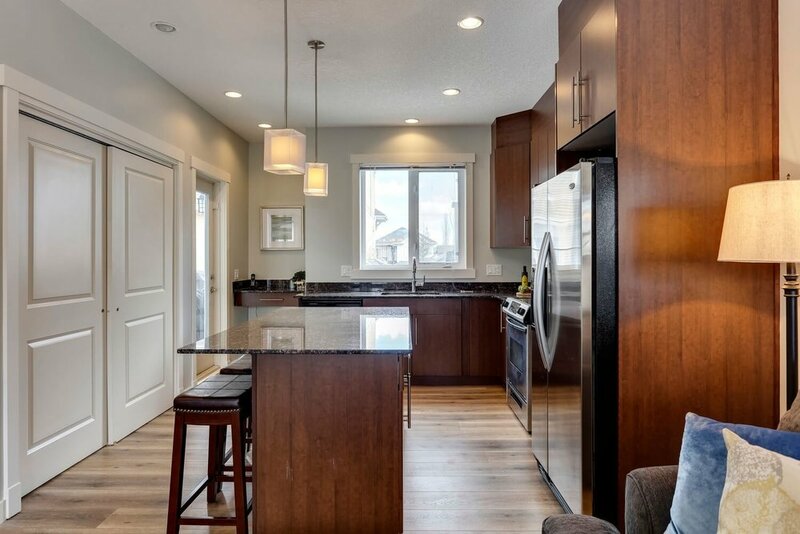 The contemporary kitchen features full-height cabinetry, GRANITE countertops, recessed lighting, pull-down faucet, sliding-door PANTRY, centre ISLAND with seating, and a command centre nook. Enjoy summer nights on the SW-facing balcony right off the kitchen. Living room with gas FIREPLACE and TV nook with built-in storage. The convenient main floor powder room is ideal for guests. Upstairs the master comes with closet organizers and has a large ENSUITE with granite and lots of storage. The 2nd bedroom comes with its own BALCONY. There’s also a full bathroom and upper-level LAUNDRY. Finished basement FLEX space. NEW PAINT & FLOORING (premium scratch-resistant wide-plank vinyl). Get into the DESIRABLE community of West Springs at a competitive price point. Close to PARKS, schools, shopping and more.